More than $1260 a year—that’s the average cost of a high-end smartphone in the U.S., once you factor in the cost of the voice, data, and text services. Yes, for about $105 a month, you earn the privilege of Instagramming your Sunday brunch and having nearly 24/7 Web access at your fingertips. The hefty cost of smartphone ownership has to make you wonder what people around the world are paying for the same devices and services that we have here. Given our massive rate of data consumption and the big charges that show up in our monthly bills, we must be paying more than everyone else in the world, right? Right? When you add everything up, the total cost of owning a smartphone in the United States is about the same as the cost of owning one in Japan or Germany. Ultimately, our phone costs fall somewhere in the middle: We don’t have the cheapest phones and plans in the world, but we don’t have the most expensive, either. Smartphones—the devices themselves—cost pretty much the same around the world as they do here. The service plans are responsible for the big differences between carriers globally. To investigate those differences, I calculated the average cost of two-year ownership of an Apple iPhone 5 in the United States and in five major mobile markets around the world: Australia, China, Germany, Japan, and the United Kingdom. I sampled the prices charged by the largest carriers from each country. For each, I picked a standard plan: I compared plans that offer 2GB of data and unlimited voice and text—or the closest equivalent to that—for one person with a single mobile device. I found that owning an iPhone 5 is least expensive in the U.K., at $64.70 per month on EE. Japan is next, at $74.11 per month on Au Kddi. Germany placed third at $92.13 per month on T-Mobile Germany. China’s Unicom charges $96 per month; and Australia’s Telstra will cost you $116.23 per month. 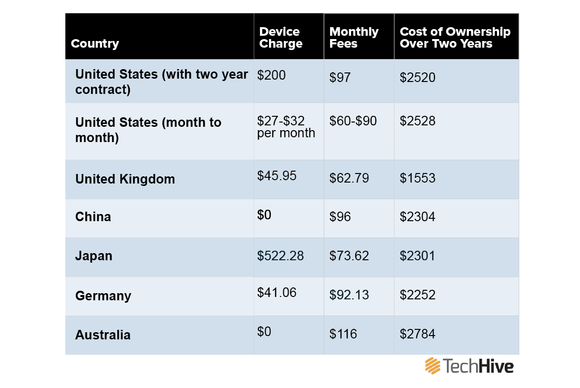 The average cost of owning an iPhone 5 from AT&T, Sprint, T-Mobile, or Verizon in the United States is $105 per month. To determine these averages, I calculated what the monthly fees would cost over a two-year period, added the cost of the phone itself, and then broke that sum down into a monthly cost across 24 months. Cost of an iPhone 5 over two years, based on a 2GB data plan. U.K. consumers seem (at first look) to have the best deal, with a $1553 two-year cost of ownership. EE offers several data rates and minutes allocations to choose from, which of course determines your monthly bill. It also determines how much you’ll pay as a deposit for the device up front: The higher your monthly bill, the lower your phone cost will be. The phone cost won’t drop all the way to zero in any case, but subscribers can walk away with an iPhone 5 for $15 if they sign up for a plan covering 10GB (or more) of data a month. But before you pack your bags and buy a one-way ticket to London, note that the quoted cost doesn’t include roaming or international calls. And because of the U.K.’s proximity to the rest of Europe, most customers likely either pay to have some international plan built in or endure occasional overage fees. Adding extra roaming and international minutes costs £12 ($18.42) per month, which translates into an additional $442.08 over two years. And that’s the bare minimum cost. Smartphone users in the United States seem to be roughly on a par with consumers in Australia. Our plans cost about the same for data and unlimited voice/text within our countries. Though the fee structures are different—Telstra factors the device cost right into the plan, so subscribers pay nothing up front, but they have a bundled bill over the course of their contract—the bottom-line figure is quite close. A busy EE store in the U.K., where EE, T-Mobile, and Orange operate together. For example, in the United States, a contract-free 16GB Samsung Galaxy S4 costs $750 on its own, or $630 to $650 through a carrier. In the U.K., the cost is roughly £500 to £649 ($760 to $986). In Japan, the nation’s largest carrier, Docomo, offers the S4 for ¥83,160 ($838) to buyers prior to signing up for a plan. Since carriers in other countries typically don’t subsidize phone costs within their plans, customers must purchase the phone at full value in order for retailers to make any profit. If you think Japanese consumers have it better than we do, take a closer look. Plans offered by Japan’s Au Kddi don’t take the cost of the phone into consideration: Customers can pay for the phone entirely up front, or they can add a monthly payment to their plan over 24 months—totally unsubsidized. Also, carriers in Japan usually don’t offer unlimited voice or messaging plans that include communicating with people on other carriers. So the “unlimited” plan that Au offers covers only Au-to-Au calls. If you want to call or text a friend on another carrier, you’ll have to pay ¥21 ($0.21) per 30 seconds or ¥3.15 ($0.03) per outgoing text. Those aren’t exorbitant charges, but they can add up. AU's "unlimited" voice plan actually limits you to other AU customers. Germany and China, meanwhile, finish almost neck-and-neck, with a $52 difference after two years. T-Mobile Germany requires a standard one-off charge for the device, and then makes up for the rest of the cost in the bill. So does China, but its pricing system is a little more complex: The higher your monthly bill is, the lower your down payment will be. For example, for a 16GB iPhone 5, a customer who wants 1.6GB of data a month or more will receive the iPhone practically for free. But China doesn’t offer a truly unlimited calling plan. The plan we looked at allows you 1950 minutes and 580 texts nationally—a respectable number—but then charges you $0.02 per minute or per text for any overages. These additional plan charges seriously level (and in some cases countertilt) the playing field. But no matter where you live, your mobile bill covers both the service and what Hays calls the “cost to serve,” meaning the cost of new towers, construction, labor, and other behind-the-scenes backhaul infrastructure. Despite the general similarity of smartphone prices worldwide, the way devices are paid for constitutes a big piece of the billing puzzle. Most U.S. subscribers receive a hefty “discount” on a new phone if they sign up for a two-year contract with their carrier. Carriers here anticipate recouping that loss through plan cost—and when you factor in that monthly plan, the overall prices even out a bit. But the subsidy model that’s familiar to U.S. smartphone users is common mainly here and in the U.K. In most other countries, consumers have to purchase the device at full price at the outset, or make monthly payments on the phone until they’ve paid it off. “There’s a tremendous amount of diversity on how plans are priced,” said Hays. Starting with the basics, all plans are either prepaid or postpaid. In the United States, postpaid plans are the norm: We use our phones at will, and then we pay the bill at the end of the month to cover all of our transactions. Contracts designate a set amount of voice minutes, text messages, data, and constraints on who you can communicate with and when within the confines of your plan, so you’re usually paying a set amount every month. You can exceed your allotment, but you’ll be smacked with additional charges if you do. According to Hays, this model is typical in Canada, Japan, the U.K., and Western Europe. Most of the rest of the world operates on a prepaid cycle. Customers pay as they go, putting money toward their phone and adding more when the remaining amount of service they’ve paid for gets low. Cash goes toward a catchall pot that covers messages, voice, multimedia, and data. And that’s what we’re seeing in emerging markets. 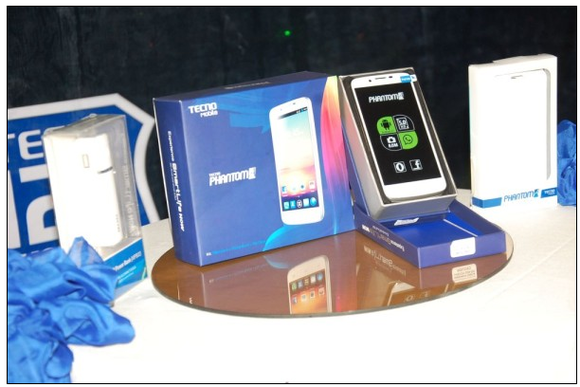 China-based Tecno has recently opened a factory in Nigeria, bringing affordable phones to the Nigerian market. Because these countries have extremely large populations, mobile carriers and manufacturers have a lot to gain by making mobile devices affordable to the public—millions and millions of subscribers means millions and millions of dollars in the bank. “Penetration potential promises to make smartphones available to a whole new sector that could never afford them before,” says Hays. Consider India, a country that Hays considers “a critical center for mobile data growth.” India currently has 699 million active subscribers, amounting to 73.1 percent of its total population. The average mobile bill in India is only $2 a month for a basic voice and messaging plan, according to Hays, with calls averaging 0.25 rupee (a fraction of a penny) per minute. That seems insanely low. Costs are kept low in part by the population’s low average income, and in part because cheaper equipment makes providing services in emerging markets less expensive. Operator costs for voice calls are not especially high either—carriers have excess voice capacity and can offload it for less. 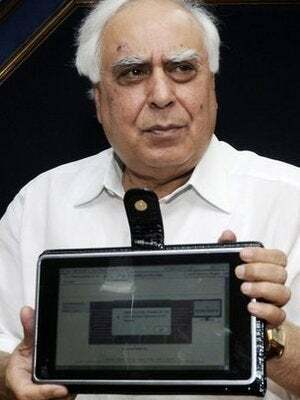 India's Kapil Sibal shows off the $50 Indian-made Aakash tablet. India’s government is lending a hand in helping mobile use grow, too. In January, Indian IT Minister Kapil Sibal launched a “Scheme for IT Mass Literacy,” with the goal of making one person in each household e-literate. Because 59 percent of Indians have access to the Internet only via mobile, expanding mobile reach is the most promising way of achieving that goal. In 2012, the government brought low-cost, locally made tablets into public schools nationwide. This Android-based tablet, called the Aakash, costs buyers only $50. Local manufacturing of devices like the Aakash keeps costs down, as well. In developing countries, small companies are popping up that market their phones only in that area. Intex in India offers Android phones for as little as $64. China-based Tecno recently built a factory in Nigeria, where it will manufacture phones specifically for the Nigerian market. Tecno’s current lineup of Android phones start at $82. And Smartfren in Indonesia aims to keep phone prices low, as about half of all phones in Indonesia are priced at under $50. An ad for Indonesia's Smartfren shows off affordable data plans. In other emerging markets, companies (and in some cases governments) are introducing financing plans and rebates to make devices more affordable. On January 1, Malaysia began to offer a rebate on monthly smartphone plans for people between the ages of 21 and 30 with monthly incomes below $925. China’s three big carriers—China Mobile, China Telecom, and China Unicom—also offer rebates on phone plans. For Unicom customers, the rebate amount depends on the cost of the monthly plan, ranging from 66 to 245 yuan ($10 to $40) per month for a two-year contract. Whether you live in Calgary or Calcutta, some worldwide trends in phone pricing are starting to emerge, indicating what we might see next. “We can expect to see a lot of innovation in mobile device financing in the next few years,” says Hays. This includes different ways that phone prices are bundled into monthly plan costs, monthly financing on devices alone for regions where prepaid models are in, and even leasing or renting devices from carriers. Carriers and third-party operators are cashing in on how quickly we swap out our devices for the next hot young thing. Most retailers have buyback and resale programs, under which they’ll cannibalize your old phone for replacement parts or sell the phone to someone else for a low price. Some buyback programs even take previously loved phones and sell them in bulk to international distributors. “Yesterday’s smartphone becomes today’s smartphone in a developing market,” says Hays. As for the United States, plans and phones may not be getting any cheaper, but carriers are starting to bend a bit, if 2013 is any indication. So far, three of the four major U.S. carriers have introduced contract-free options that don’t lock customers in. Chances are, we’ll see more-creative plans and phone financing options as our mobile needs change. And when you look at our numbers compared to those for phones in other countries, you’ll see that the grass isn’t necessarily greener overseas.